Would his departure make any real differences to her life, she asked herself? she didn't even have to think about the answer, and it burned in her stomach. If he left, it would make very little difference to their lives. And that realization disturbed her more than any other. The drive into the city, however, had allowed him to come to one conclusion. He was determined to get through Christmas without having to make a decision. If he boxed cleverly, dance around questions, parried issues, deflected attacks, he thought he might just be able to do that. He just needed a little more time to think things through. A couple of days, a week, maybe a month or two to make a decision. Coward, something that might have been his conscience heckled. And he had to agree. "What do you think I should do?" Steaphine asked miserably, because deep in her heart, she knew that her friend was right. "You've been together for eighteen months; it's time for him to put up or shut up. Force him to make a decision. Make him choose. You or the wife. And you know something? You're really asking him to be fair to both of you, because right now, he's being neither fair nor truthful with either one of you." I don't read adult novels often, I'm definitely more of a YA girl. But every once in a while it's nice to read something I can relate to a bit more. Of course, in this case I can't relate to the characters (and I hope I never do), but the more adult themes seeped in reality were a nice change. Colette takes an interesting approach to this story and her characters. 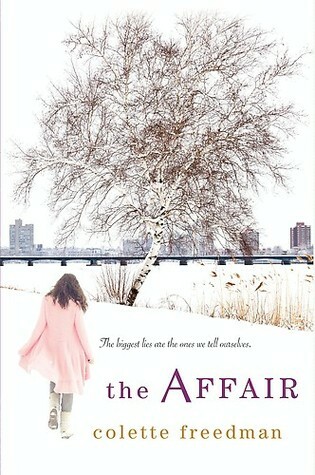 The Affair consists of three mini stories - Kathy (the wife), Robert (the husband), and Stephanie (the mistress). All three stories encompass the same few days and give us glimpses of certain conversations and events from a different perspective. While there were times when this repetition was annoying, I loved reading how these different events were interpreted by each individual. This narrative style also allowed us to get deep into each narrators head and feel (depending on the narration) some pity for their plight. Granted, I don't feel terribly sorry for Robert for having an affair, but Robert and Stephanie became a bit more sympathetic after being in their head. With Kathy we see search for concrete evidence of her husband's deception and try to figure out what her next steps will be if he's having an affair; Robert struggle with his conscience regarding his actions; and Stephanie attempt to balance her personal and business relationships while being the other woman. I went through a wide range of emotions with this novel. Suspicion, confusion, anger, sadness, a lot of anger, disgust, and (somewhat) happy. Told in the same narration style, I'm excited to read The Consequences and find out what happened after the conclusion of The Affair.